Glioblastoma multiforme (GBM) is the most aggressive malignant brain tumor known with a poor survival rate despite current advances in the field of cancer. Additional research into the pathophysiology of GBM is urgently needed given the devastating nature of this disease. Recent studies have revealed the unique cellular physiology of GBM cells as compared with healthy astrocytes. Intriguingly, GBM cells are incapable of de novo cholesterol synthesis via the mevalonate pathway. Thus, the survival of GBM cells depends on cholesterol uptake via low-density lipoprotein receptors (LDLRs) in the form of apolipoprotein-E-containing lipoproteins and ATP-binding cassette transporter A1 (ABCA1) that efflux surplus cholesterol out of cells. Liver X receptors regulate intracellular cholesterol levels in neurons and healthy astrocytes through changes in the expression of LDLR and ABCA1 in response to cholesterol and its derivatives. In GBM cells, due to the dysregulation of this surveillance pathway, there is an accumulation of intracellular cholesterol. Furthermore, intracellular cholesterol regulates temozolomide-induced cell death in glioblastoma cells via accumulation and activation of death receptor 5 in plasma membrane lipid rafts. The mevalonate pathway and autophagy flux are also fundamentally related with implications for cell health and death. Thus, via cholesterol metabolism, the mevalonate pathway may be a crucial player in the pathogenesis and treatment of GBM where our current understanding is still lacking. Targeting cholesterol metabolism in GBM may hold promise as a novel adjunctive clinical therapy for this devastating cancer. 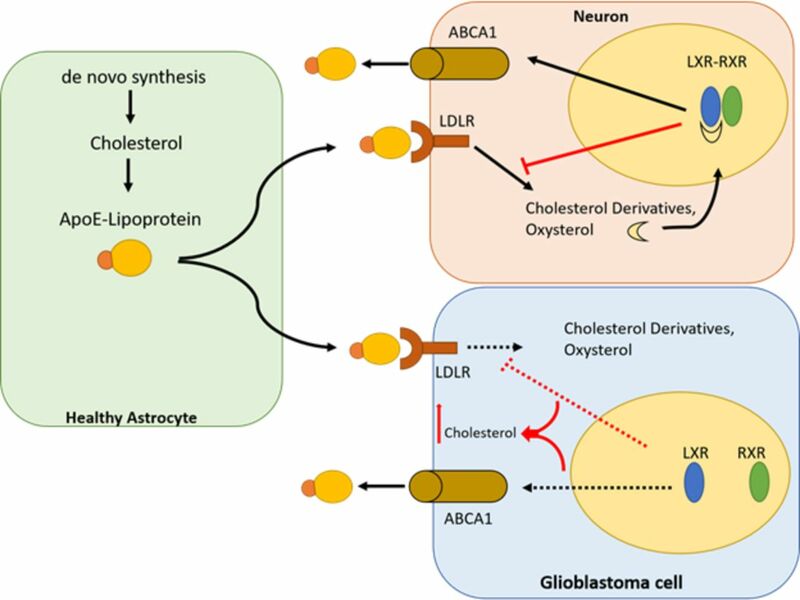 Neurons and glioblastoma cells rely on astrocytes to provide cholesterol via de novo synthesis. Neurons and glioblastoma cells do not use de novo synthesis of cholesterol and are dependent on uptake of exogenous cholesterol. They take up cholesterol produced and secreted by astrocytes in Apo-E-containing lipoproteins. Oxysterol and cholesterol derivatives produced in neurons following cholesterol uptake and metabolism are physiological agonists for LXR. Activation of LXR results in its dimerization with RXR and subsequent increase in ABCA1 cassette protein expression, the main exporter of cholesterol in the form of Apo-E-containing lipoproteins. It also inhibits the expression of the LDL receptor resulting in a decrease in cholesterol uptake, thereby regulating the level of intracellular cholesterol. In GBM cells, these cholesterol regulatory and surveillance mechanisms are disrupted. Thus, following the uptake of cholesterol in Apo-E-containing lipoproteins and the metabolism of cholesterol in GBM cells, oxysterol and other cholesterol derivatives are unable to activate LXR leading to the accumulation of intracellular cholesterol. ABCA1, ATP-binding cassette transporter A1; Apo-E, apolipoprotein E; GBM, glioblastoma multiforme; LDL, low-density lipoprotein receptor; LXR, liver X receptors; RXR, retinoid X receptors. There are other approaches involving cholesterol metabolism known in the GBM field. Phytol and retinol kill glioblastoma cells by interfering with fatty acid and cholesterol metabolism. The higher levels of lipids in GBM cells, necessary for their survival is partly due to involvement of an oncogenic pathway called epidermal growth factor receptor (EGFR)/PI3K/Akt. This pathway increases levels of intracellular lipids and upregulates sterol regulatory element-binding protein (SREBP-1) which, in turn, enhances lipid uptake.31 Therefore, SREBP-1 suppression can also lead to GBM cell death.32 Phytol alters the expression of SREBP-1 and sterol regulatory element-1, which are important constituents for regulation of cholesterol metabolism.31 Expression of fatty acid synthase (FAS) protein, a key tumor lipogenesis enzyme, is regulated by SREBP-1. Phytol and retinol inhibit SREBP-1 and FAS expression in U87MG, A172, and T98G cell lines of human glioblastoma.31 Thus, targeting GBM cells with phytol and retinol represents an alternative strategy in the fight against GBM. Archazolid B is another drug used in the treatment of GBM. By affecting specific genes, its application results in the accumulation of free cholesterol within intracellular organelles and effectively depletes usable cellular cholesterol. Although archazolid B upregulates LDLR, which increases extracellular cholesterol uptake, it hampers the action of V-ATPase due to a proton transport defect. This leads to associated increases in lysosomal pH, thereby preventing cholesterol recycling.33 This ‘sequestration’ of cholesterol makes it effectively absent for use by GBM cells. It is tempting to think that combinations of the above approaches to control cholesterol hemostasis in GBM cells could lead to a more robust therapeutic strategy in GBM than what is currently available. In general, drug resistance is a serious problem in cancer therapy targeting cell death, especially in GBM. In light of currently applied strategies targeting GBM, it is important to realize that levels of intracellular cholesterol in GBM cells determine their resistance to chemotherapeutic drugs, such as temozolomide (TMZ), particularly in long-term treatment approaches.34 Although the distinct lipid metabolism of GBM cells has been reported, the role of intracellular cholesterol flux in TMZ-induced cell death requires additional investigation. 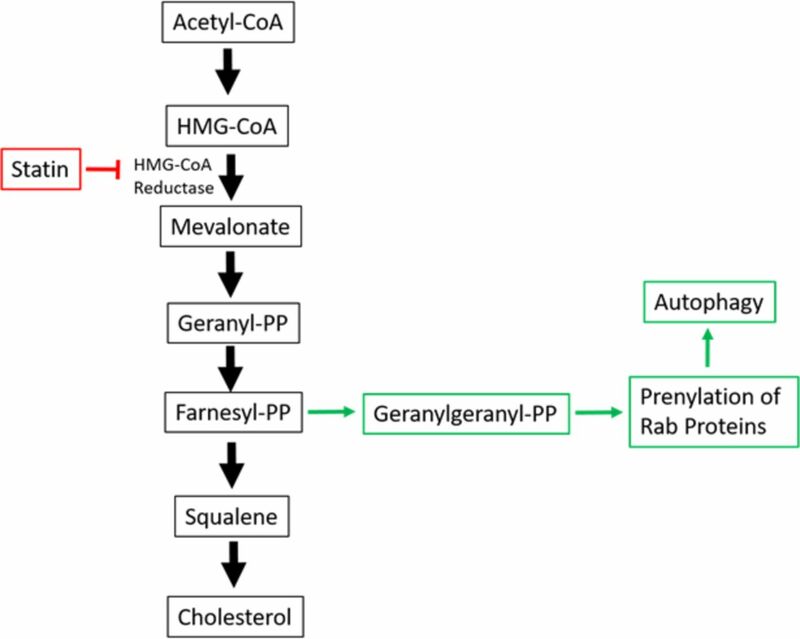 Role of the mevalonate pathway in autophagy. The mevalonate cascade is the de novo pathway for cholesterol biosynthesis in cells. It is also responsible for the production of the isoprenoids such as geranylgeranyl-pyrophosphate (geranylgeranyl-PP) that play an important role in the prenylation of the superfamily of Ras-like GTPase proteins known as the Rab family. Rab GTPases are involved in vesicular trafficking where Rab11 and Rab7 are critical components for autophagosome formation and autophagosome–lysosome fusion. Statins lower cholesterol due to inhibition of HMG-CoA reductase, the rate-limiting enzyme in cholesterol biosynthesis, but they also reduce mevalonate and the downstream isoprenoids. Thus, inhibition of the mevalonate pathway by statins results in decreased prenylation of Rab11 and Rab7 and subsequent inhibition of autophagy flux. HMG-CoA, 3-hydroxy-3-methyl-glutaryl-coenzyme A; PP, pyrophosphate. In summary, a deeper understanding of the role of cholesterol metabolism and transport in GBM cells and the underlying mechanisms of cholesterol-related drug resistance will be useful in improving current treatment strategies for patients with GBM. Mevalonate biology and autophagy are intimately linked at a more fundamental cellular level, where both pathways are amenable to pharmacologic manipulation. Furthermore, such an understanding could lead to the development of targeted and more effective therapies for GBM patients, a devastating disease with poor prognosis.
. Inhibition of autophagy by mevalonate pathway inhibitors, a new therapeutic approach to sensitize glioblastoma cells to temozolomide induced apoptosis. Faseb J 2018.
. Phase II study of atorvastatin in combination with radiotherapy and temozolomide in patients with glioblastoma. J Clin Oncol 2014;32. Contributors SS conceived the idea and manuscript, LP and NS drafted the manuscript, SS and SG approved the final version of the article. AAZ added original content then also reviewed, edited and approved the final version of the manuscript. Funding SG was supported by Research Manitoba New Investigator Operating grant and Health Science General Operating grant. SS was supported by MITACS accelerate (formerly called Mathematics of Information Technology and Complex Systems) postdoctoral fellowship. AAZ was supported by U.C. Davis PI Bridge Funds and Tobacco-Related Disease Research Program.